Help! I’ve found a bunny! Is a Bunny Right For You? 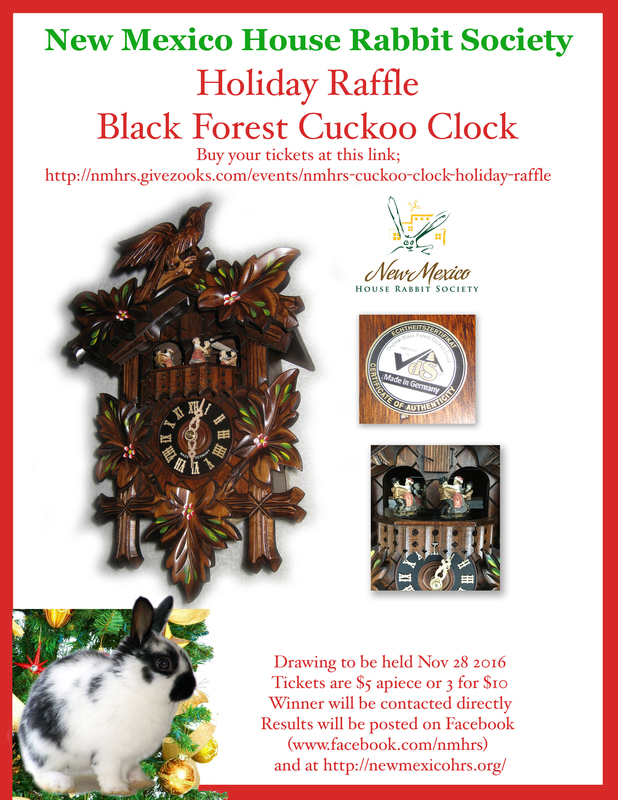 Win a Black Forest Cuckoo Clock! This classic example of Old World folk art captures the charm and simplicity of 19th century country living. The movement is based on the time tested chain, weights, and pendulum system of measuring time – no batteries, no plug in – just classic, precision clock craft. Every hour the cuckoo announces the passage of another sixty minutes and the dancers waltz their way across the clock’s balcony. This is a beautiful and functional work of art that can be yours just in time for the holidays. Every donation helps save a bunny! Tickets are $5 each or 3 for $10. You may purchase as many as you want. Drawing to be held November 28, 2016. If you want to buy raffle tickets online, you can purchase them at 3 for $10 only. Pictures of your ticket subs will be sent to you via email and the winner will be contacted directly. Shop at Amazon Smile and Amazon will make a donation to New Mexico House Rabbit Society! New Mexico House Rabbit Society is an all-volunteer, nonprofit organization whose mission is to help rabbits who need homes in New Mexico, with a special focus on the Albuquerque and Santa Fe area. We are an official chapter of House Rabbit Society. Please donate now to support our efforts. New Mexico HRS has events throughout the year, from adoption events at our partner stores, events at our shelters, and educational and outreach events at community events. Check out our upcoming events on the NMHRS Facebook Events page!